I installed Evotech frame and axle sliders and prefer the subtle look vs. crash bars which no doubt provide the best protection. I still think they provide engine case and water pump cover protection and should go a long way towards saving the fairings in a minor drop. If I were to add crash bars down the road I’d go with SW Motech for the design and color which blends nicely. Re: Crash bars vs. sliders? Would like to hear from anyone using SW Motech crash bars. Based on drawings and pictures, I wonder about banging my knees on the bars. I am 6' with 33" inseam. My sentiments exactly Conman. The first thing that attracted me to this bike was it’s beautiful styling. When I reviewed the specs I noted the 500 lb. weight which told me I wouldn’t be buying it for a lot of off-road use. 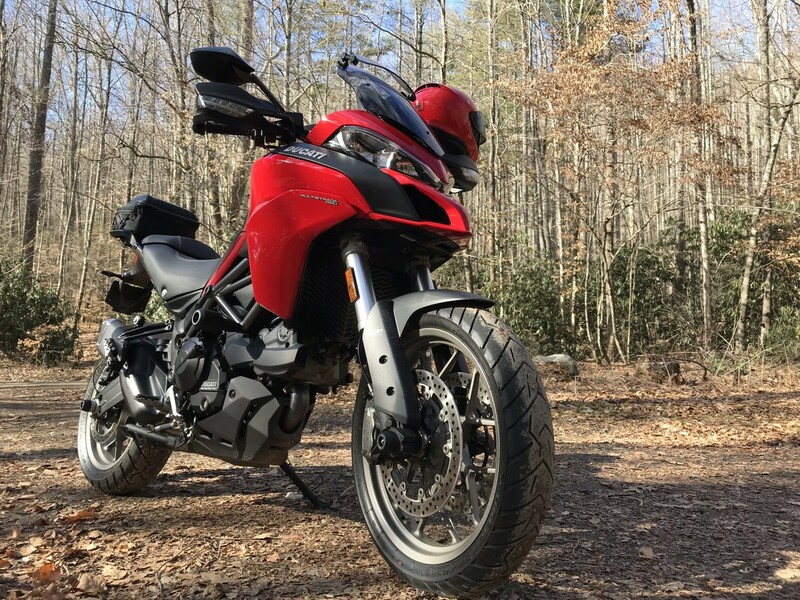 I prefer it as a sport touring bike that only occasionally sees a graded forest road connecting preferred routes of tarmac. So the question I asked myself was how likely am I to need ultimate crash protection? And do I really need to muck up the fine Italian looks of this beauty? Thankfully, we have many options for the level of protection needed based on how we ride. For anyone that has no problem lifting this machine after a drop on uneven ground, I salute you! I use mine for commuting everyday as well as tours in the summer. I've already had someone drive into the side of me in traffic (and run over my foot as I tried to get my balance). Not a scratch anywhere, don't know what his car was like tho because it was dark I had a sore knee but otherwise ok.
Ouch! Glad you and the bike came through relatively ok. Another example of why I stick to backroads and scenic routes for most of my riding and always assume every driver I meet doesn’t see or respect motorcyclists. Also read some bad reports about crash bungs damaging frames during slides. One reviewer listed on TwistedThrottle for the 950 gave SW’s crash bars 5 stars but no reference on rider ergo’s. I had a set on my Husky Terra and would rate them as excellent. I’m a bit biased must admit, big fan of their products. Only thing I didn’t like was their tail rack for the Multi. It functioned well but looked awful by itself without a bag mounted. The Touratech Ducati rack flows seamlessly with bike in looks and performs nicely as well. Hope this helps with your decision. Moto45 - that information is very helpful. Thank you. I just installed the SW_Motech crashbar on my bike this week-end and can now provide some additional feedback. I'd like first to make a comment about the part number. When I purchased on Revzilla, it was not available for the MTS 950, only for the MTS 12000. After visiting the SW-Motech site, I confirmed that SBL.22.584.10000.B was the right part number and ordered it from Revzilla despite their warning it was not going to fit my bike. Revzilla has since modified its recommendation. I selected this model over others for 2 reasons: esthetic and price. I felt it was not going to be out of sort and would somewhat blend with the rest of the bike style. while riding, the end presses my calf about 2" below my knee. it does not poke my leg or is uncomfortable in anyway. It does does catch my pants when putting my foot down (unlike the original plug). when my foot is down, it presses my thigh about 2-3" above my knee. when engine gets hot (204F - sorry to confess that we had a hot day in San Francisco, air temp 80F), the bar will get warm on the left side. Nothing unbearable but it is worth mentioning. Overall, I find the bar unintrusive both ergonomically and esthetically. The price was right. Hopefully I wont have to find out if it works.